Professional Kanshi poet and calligrapher. Tanpu was born in Owari Domain (present Aichi Prefecture) at the end part of the Tokugawa Shogunate period (1867). His real given name was Kumenojo. From his childhood, he learned Kanji characters and grammar. He also kept studying Kanshi poem. After around the middle part of the Meiji era (1868-1912), he issued many Kanji poems and became famous as a Kanshi poet. He deceased in the 39th year of the Showa era (1961) at the age of 97. 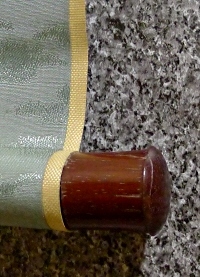 Description This scroll was depicted in the spring of 6th year of the Showa era (1931). There are some faint spots on the painting part. Ume (Japanese Plum) tree and flowers are drawn simply and artistically in the Suiboku black ink painting method. A Kanji poem is also drawn at the top.